Because He is intoxicated by ecstatic love and is an incarnation of mercy, He (Lord Nityananda) does not distinguish between the good and the bad. He delivers all those who fall down before Him. Therefore He has delivered such a sinful and fallen person as me. This year the devotees of Sri Chaitanya Saraswat Math sought the sweet shelter of Lord Nityananda’s divine lotus feet by honouring and celebrating His most holy appearance day at His sacred birthplace in Sri Ekachakra Dham. By the grace and the divine vision of Srila Acharyyadev Srila Govinda Maharaj, Sri Chaitanya Saraswat Math has now purchased land in the holy abode of Sri Ekachakra Gram and that land is currently being prepared for the construction of a four-storey guesthouse to serve the visiting devotees. A grand and glorious festival was held at that very site to celebrate the glories of our most merciful Lord Nityananda, our gracious Guardians, and the mission of Sri Chaitanya Saraswat Math. 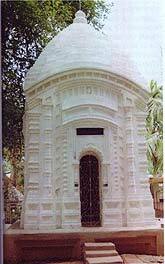 Ekachakra is in the area called Rarh-desh in the Birbhum district of Bengal. It is more widely known now as Virachandrapur, named after the son of Lord Nityananda, Virachandra Prabhu. From the Sri Chaitanya Saraswat Math in Nabadwip, it is a journey of four to five hours by car or chartered bus. Our bus is full with dozens of pilgrims overflowing the seats and lining the aisle and stairwell of the bus, their eagerness pulling them to the holy land. Our party leaves Nabadwip before dawn and arrives in Ekachakra near nine in the morning. The Sri Chaitanya Bhagavat tells us that from the time of Nityananda Prabhu’s appearance everything became auspicious in the region of Rarh-desh. Famine, poverty and all kinds of natural disturbances were driven away. The land became opulent and supplied the residents and cows with sweet nourishment. Walking through the simple and pristine village I am reminded of the words of Sri Chaitanya Bhagavat. The deeper beauty I am not able to see, and the sacred mood I am not able to feel; but even on the surface, Sri Ekachakra has a sublime and pure loveliness that softens the heart. Here is a place of unique and natural beauty. The sounds, smells, textures and shades of light have a sweetness and a mildness. There is the opulence of cows and their lotus-eyed calves in the courtyard of each simple thatched home. A simple wealth of land, gardens, fruits and abundant milk and water. Lush emerald green rice fields and kundas frame the land. On this special morning all of the surrounding area is softened, the colors muted by a thin gauze of early mist. The spring air is cool, and sweet breezes move through the leaves of the auspicious trees of Ekachakra. Several devotees have already been here for days serving and preparing for the big festival. A huge pandal has been erected along with a decorated stage for kirttan and speakers. Large photographs of our Guides, our Divine Guardians, give their gracious glance. A structure for cooking the feast that will be served to thousands contains the cooking pots that are the size of small boats. Mountains of vegetables lie ready to be cooked and offered for the Lord’s pleasure. A beautiful double altar has been set up. One side holds the photo of Their Divine and Merciful Lordships Sri Sri Nitai Chaitanyadev from our Puri Temple and on the other side resides the photos of the most merciful and lovely Sri Sri Guru Gauranga Gandharvva Govinda Sundarjiu. The mandir pandal is decorated with endless fragrant flower garlands, auspicious mango leaves, colourful streamers and bright lanterns. O Nityananda Prabhu, emperor amidst the personal associates of Sriman Mahaprabhu! Kindly grant this fallen soul deep and resolute faith in that pure and divine figure of Sri Gauranga. Lord Gauranga’s personality exclusively embodies the sweet nectar relished deep within the devotional mellows of Sri Sri Radha-Krishna’s Pastimes. But if Your lotus feet are over-looked, then all so-called devotional orations and prayers meant for the highest worship become false, like a dream. I worship You, that great personality Nityanandachandra, who openly bestows shelter to the most fallen souls, freely granting the association of Sri Gaurangadev. The bright sun floats up over the fields and burns off the morning mist and our festival begins with a parikrama around the sacred land. Almost directly across from our new land is Bakultala—the bakul tree under which Lord Nityananda played with his childhood friends. The original tree no longer exists, but some of the original branches can still be seen. 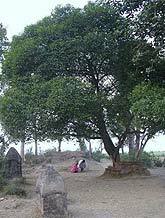 It is also said that the umbilical cord of Nityananda Prabhu is buried under this tree. The entire area around our new land is the playground of young Nitaichand. It is in a most auspicious and peaceful area. Here the Lord concealed His divine identity and happily played and re-enacted the unlimited Pastimes of Lord Krishna and Balaram and Rama and Laksman with His childhood friends. His serene disposition and charming beauty overwhelmed all the residents of Ekachakra. When Nityananda Prabhu was a small boy, He performed sweet and charming Pastimes in the village of Ekachakra. His Pastimes invoked the deepest and heartfelt happiness in His mother, father, relatives, and close friends. 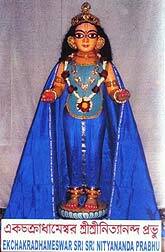 Once, a renunciate arrived at the house of Nityananda and prayed to the boy’s father for his son. Lord Nityananda was placed in the hands of the renunciate and left to visit the holy places of pilgrimage, wandering the length and breadth of India. Let us eternally worship that great personality Sri Nityananda-chandra, who freely grants the association of Sri Gaurangadev, who is none other than Lord Krishna. Also close to our land is Padmavati Tank, a pond named after the divine mother of Lord Nitai. Across the fields of rice in the other direction is the Pandavtala. This is an enormous banyan tree that marks the area where the five Pandavas and Srimati Kuntidevi resided when they were in exile. Just down the road from us is the temple in which the most beautiful moon-like Deity of Ekachakradhameswar Sri Sri Nityananda Prabhu resides. Bowing down, we pray that He will please see us and utilise us to serve Sri Guru and Vaisnava. Within the temple grounds is also the Sootika Mandir, or the maternity mandir, which marks the appearance place of Sri Nitaichand. Some distance away is Kadambakhandi, a holy spot where the silk-like water of the Jamuna River miraculously flows. Pilgrims rush and push toward her—thirsty for her mercy drops. There is a small mandir at this spot where Their Lordships Nitaichand and Gaurasundar are worshipped along with Lord Krishna and Lord Balaram. Large bats fly nearby and hang upside down in the tangled branches of the kadamba tree. Still further away is the famous temple of Banka Rai or Bankimdev. The devotees hold sweet kirttan and discourses here under the darshan of the Lord. Continuing on the parikrama path we come to a temple of Sri Jagannathdev along with Sri Saksigopal. These are just a few holy places and there are so many more transcendental spots where Lord Nitaichand performs His divine lila. At our pandal, Sripad B.N. Acharyya Maharaj, Sripad B.P. Tirtha Maharaj, Sripad B.A. Madhav Maharaj, Sripad B.D. Damodar Maharaj and Sripad B.R. Bhagavat Maharaj lead heart-attracting kirttans and give moving discourses about the glories of Sri Ekachakra Dham, Lord Nityananda and our divine Guru-varga. We hear with much interest the Pastime in which His Divine Grace Srila B.R. Sridhar Dev-Goswami Maharaj travelled to Ekachakra Dham after finishing his missionary activities with the Gaudiya Math. Giving his full dandabat pranam to seek Sri Nityananda Prabhu’s grace, he prayed and Lord Nitai answered his prayer by saying, “What is existing there within you, what is your property, is the full wealth and mercy of Mahaprabhu; but you are not giving that wealth to others. Then why are you coming now and asking for My mercy and My blessings?” Srila Guru Maharaj reflected deeply on this. Previous to this Srila Guru Maharaj, out of profound humility, had resolved not to accept disciples. But to please Sri Dayal Nitai, Srila Sridhar Maharaj began to accept disciples and share his divine storehouse of wealth and deep realisation. Every month Srila Guru Maharaj would send a donation of five rupees (which today would be approximately 500 rupees) to the birthplace of Lord Nityananda. From upon the stage the venerable Vaisnavas share deeply about Lord Nityananda. The visitors to our pandal listen respectfully and attentively to the heart-melting message of our Divine Masters—by the mercy of Nityananda Prabhu we can receive the mercy of Mahaprabhu. And if one takes shelter of Mahaprabhu, Lord Nityananda is very, very merciful and gives the wealth of Krishna-Prema to him. If one simply chants with sincere heart, “Jaya Gaura Hari! Jaya Sachinandana!” Lord Nityananda thinks, “I am the slave of him,” and He gives everything. O my Lord Nityananda, the jewel of all good qualities; O Nitai, the jewel of all good qualities has brought a flood of ecstatic love of Godhead that has drowned the whole world. O people of faith! O people of faith! By the order of Lord Gauranga, O brothers, I beg these three requests of you: Chant “Krishna!” worship Krishna, and teach others about Krishna. In the evening hours thousands of guests enter the pandal to chant, hear Hari-katha and to watch a slide show about the glories of Sri Nabadwip Dham and Sri Chaitanya Saraswat Math. The slide show ends with the photos of the fireworks display over Sri Govinda Kund on Sri Gaura Purnima. Just as the slide show ends a full and glorious fireworks display begins outside our pandal. Countless men, women and children watch with delight as the fireworks shoot toward the nearly full moon and explode into colorful malas and starbursts. The night sky is illuminated and there is a happy family feeling of home comfort surrounding us. Sripad Acharyya Maharaj reports that 21,000 plates of prasadam were served on this auspicious day and 4,000 or more guests watched the slide show and fireworks display. This whole long, sweet day was possible only through the grace and mercy of Sri Dayal Nitai and Gaura Hari. On this day we remember the glories of His Divine Grace Srila Govinda Maharaj by whose holy vision we have come to try to offer service in Sri Ekachakra. Srila Govinda Maharaj has often noted that in Srila Sridhar Maharaj's last days, when Srila Guru Maharaj was upstairs in his rooms, he was always chanting, “Dayal Nitai, Dayal Nitai.” Always his conciousness was under Nityananda Prabhu’s mercy, and he was always thinking of Nityananda Prabhu. Nityananda Prabhu is our only hope. He is so benevolent, so generous, so gracious, that very easily we can draw his attention and we can get his recommendation. All who attended this holy celebration in the transcendental land of Lord Nityananda have considered it a grand success. I feel that I have received something of inexplicable value. Here, in the holy Dham, humility is the sought-after jewel. Today I have seen the sincere devotees in such a sweet and natural serving mood. To the ordinary eye they may appear very simple and poor, but actually they are decorated with the most priceless ornaments of Vaisnava humility, tolerance and giving honour to others. All glories to all the devotees of Sri Chaitanya Mahaprabhu, for the Lord is their life and soul. All of you, kindly bestow devotional service upon me. I offer my obeisances to the moon-like lotus feet of Nityananda Prabhu who is the original Guru and who is always spreading the glories of Mahaprabhu and urging us to let His Name be eternally woven into the texture of our heart. I offer my obeisances to the merciful lotus feet of Srila Acharyyadev, Srila Govinda Maharaj and all our Divine Guardians who are spreading the rays of the merciful moon of Lord Nityananda and cooling our scorching hearts. I offer my obeisances to the feet of all the sincere devotees of Sri Nityananda who are always chanting His glories. I pray that I may always have the treasure of your association and follow in your footsteps. The dust and shade of the lotus feet of the Vaisnavas have been granted to this fallen soul by the mercy of Lord Nityananda.